President Donald Trump had barely begun his address to the United Nations General Assembly on Tuesday when he declared his tenure had "accomplished more than almost any administration in the history of our country," the kind of over-the-top boast he often makes at his campaign rallies. "Didn't expect that reaction, but that's OK," Trump said, momentarily startled. That prompted more guffaws and applause. Trump delivered a fiery speech here last September that raised fears of nuclear war, but many leaders appeared to view the self-praise and ominous warnings in his second U.N. address as more theater than threat. He even showed up 24 minutes late, forcing organizers to rush Ecuador's president in as a placeholder. 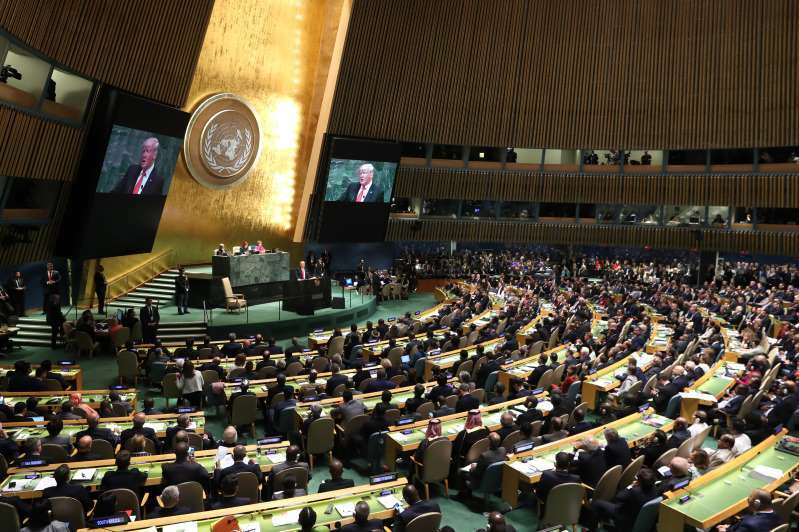 The 200 or so delegations sat silently as Trump cited what he claimed as major achievements, including the U.S. pullout from the Iran nuclear accord, his refusal to sign a U.N.-backed compact for migration, the withdrawal from the U.N. Human Rights Council and his decision to move the U.S. Embassy in Israel to Jerusalem, all decisions that many in the world body opposed. Applause at the end was polite but muted. As expected, Trump aimed his sharpest ire at Iran, blaming the Islamic Republic for sowing "havoc and slaughter" in Syria and Yemen, and spreading "mayhem across the Middle East" and beyond. "Iran's leaders sow chaos, death and destruction," Trump said. "They do not respect their neighbors, their borders or the sovereign rights of nations." He urged other countries to join an economic pressure campaign against Iran, a direct challenge to the four other permanent members of the Security Council that remain committed to the Iran nuclear deal that Trump abandoned in May. The Trump administration re-imposed sanctions last month targeting Iran's purchase of U.S. dollars, trade in gold and its automotive sector. Potentially more damaging sanctions are set to begin in November on Iran's oil and shipping sectors and its central bank. But Trump devoted much of a somber 35-minute address to promoting his "America first" agenda, and its emphasis on national sovereignty in trade, security and international affairs. "We reject the ideology of globalism, and we embrace the doctrine of patriotism," he said. He also outlined the argument for his disruptive approach to foreign affairs, from the Middle East to North Korea, where he has upended traditional diplomacy by discarding long-standing U.S. policies. "America's policy of principled realism means we will not be held hostage to old dogmas, discredited ideologies, and so-called experts who have been proven wrong over the years, time and time again," he said. Citing the dangers of illegal immigration and "uncontrolled migration," Trump argued that each country should set its own policies in accordance with its national interest. The U.N. estimated about 65 million people, mostly from impoverished nations, have been dislocated due to war, persecution, environmental disasters and economic needs. "Migration should not be governed by an international body unaccountable to our own citizens," Trump said, explaining his rejection of a newly negotiated global compact on migration. "Ultimately, the only long-term solution to the migration crisis is to help people build more hopeful futures in their home countries. Make their countries great again." Trump bore down on his persistent pledge to trim and re-prioritize America's foreign aid budget, complaining that helping poverty-stricken countries offered little benefit to U.S. interests. "The United States is the world's largest giver in the world, by far, of foreign aid. But few give anything to us," he told the world body. Trump said Secretary of State Michael R. Pompeo would take a "hard look" at the State Department budget and ensure that countries receiving aid or military protection "also have our interests at heart." "Moving forward, we're only going to give foreign aid to those who respect us and, frankly, are our friends," he said. His plan to make aid more transactional challenges, at least in part, traditional U.S. attempts to use so-called soft power to promote human rights and democracy, especially in fragile societies or those where U.S. interests are prominent. The countries that receive the most U.S. economic aid are Iraq, Afghanistan, Israel and Egypt. Despite his emphasis on sovereignty, Trump did not criticize Russia. The U.N. has criticized Moscow for its invasion of Ukraine, and its seizure of Crimea, as well as its actions in Georgia and the Balkans; and the U.S. intelligence community and a Virginia grand jury have documented the Kremlin's interference in the 2016 presidential campaign. He praised North Korean leader Kim Jong Un "for his courage" and cited the confidence-building steps both leaders have taken since their June 12 summit in Singapore. But efforts to persuade North Korea to give up its nuclear weapons appear to have stalled, and Trump added that U.S. sanctions will stay in place "until denuclearization occurs." In one of several inconsistencies, Trump attacked the Organization of the Petroleum Exporting Countries, known as OPEC, for "ripping off the rest of the world" with high prices, but then praised Saudi Arabia's leadership for what he called bold reforms. Saudi Arabia is the largest supplier by far in OPEC and is partly responsible for higher oil prices as U.S. sanctions bite into Iran's oil production. As he has in the past, he warned that Germany risks becoming "totally dependent on Russian energy" for planning an 800-mile-long natural gas pipeline under the Baltic Sea. Germany views the complaints, in part, as an effort to sell more U.S. energy, and TV cameras showed the German delegation grinning broadly after Trump's remarks. Trump praised his decision last December to move the U.S. Embassy in Israel to Jerusalem, a hotly disputed action that few in the audience favored, calling it "very historic change." Trump's critics believe he has openly sided with Israel over the Palestinians and jeopardized any chance to revive the long-stalled Mideast peace process. "The tone of this speech won't be effective outside Trump's base at home — boastful, bitter and resentful of countries that 'take advantage of us,'" Nicholas Burns, a former senior diplomat in Republican and Democratic administrations, said via Twitter. "He is not leading the world, but campaigning against it." In a departure from his usual style, Trump offered "special thanks" to the leaders of South Korea, Japan and China for their role in bringing North Korea to nuclear talks; commended Jordan for taking in refugees, and celebrated India and Poland, among others. Trump's worldview did not go unchallenged. French President Emmanuel Macron, without naming the U.S. president, delivered an implicit rebuke from the podium minutes later on immigration, women's rights and other areas of concern. "It's not acceptable anymore that an individual would have less opportunity simply due to where they were born, or their gender," Macron said in an address that was greeted with loud, sustained applause. On what may be his signature issue — climate change — Macron said that the 2015 Paris agreement had "stayed intact" despite Trump's decision to pull the United States out of the landmark accord last year. "Should someone be against, we will nonetheless press ahead," he said. Macron also praised national self-determination — but unlike Trump, said it must be tempered by international cooperation. "In the 21st century, we will only triumph through bolstered multilateralism," the French president said, decrying those who "brandish sovereignty as a way of attacking others." Iran's president, Hassan Rouhani, responded directly to Trump when he took the podium later Tuesday, reminding the world body that Washington — not Tehran — had quit the 2015 nuclear accord approved by the Security Council and enforced by the U.N.'s nuclear watchdog agency. He urged the Trump administration to end "unjust sanctions" and denounced what he called America's "authoritarian" policies, criticizing leaders who "ride public sentiments and gain popular support through the fomenting of extremist nationalism and racism." He said no nation would be brought to the negotiating table by force, but said Iran was prepared to talk. "I am starting the dialogue right here," he said, adding that it must "start with the ending of threats." "No war, no sanctions, no threats, no bullying," Rouhani said.